The purpose of this paper is to explore the history and evolution of the modern day police force options. These force options specifically include Pepper Spray, Baton, Tazer, and Firearm. The paper will take a brief look at the Political, Reform, and Community Eras in American policing in setting the historical context for the force options. The origin of each force option will be explored, along with showing the evolution towards modern day equivalents. The purpose of deploying each weapon will be shown. Finally, citations from current event articles reporting incidents involving each weapon will be provided and discussed. To better understand the history and evolution of the force options, let’s take a brief look back at the history of American policing. American policing has gone through three distinct eras, the Political Era, the Reform Era, and the Community Era. The first modern police department, which was modeled after the system Sir Robert Peel started in London, was founded in 1838 in Boston. The Political Era, lasting from 1840 to 1930, had a goal to satisfy the needs of the people and the political bosses. Officers were often not hired on basis of merit but instead on whom they knew who was in a position of power. These practices bred a culture of favors, rampant police corruption as they looked for and accepted bribes, and brutality. A change was needed. August Vollmer, a Berkeley, CA, police chief, was a key figure in implementing the start of the Reform Era. Lasting from 1930 to 1980, the Reform Era sought to limit police corruption by utilizing middle management. Unlike the Political Era, which often left the policing powers to the officers in the street who were overseen by a single chief, The Reform Era used a chain of command system to make officers more accountable for their actions. Officers were also expected to perform. The goal of the police was to control crime as opposed to satisfying the needs of the political leaders. This change of focus was an excellent correction but still had an inherent problem. In controlling crime, police were not looking to the public for help. Public relations were not a priority. Unlike the brutality and violence that often characterized the first two eras, the Community Era, lasting from 1980 to 2000, looked to improve from the progress of the Reform Era. Public relations and improving the quality of life of the people was the focus of the Community Era. The police were in charge and still sought to control crime, however there was a better way to accomplish this. Police ultimately work for the people. They are citizens too who happen to be in a position of power. If time was spent talking to people, helping to solve problems other than just crime, realizing that vented frustration was not necessarily directed towards them personally, training on behavior and psychological traits, working with and receiving information from the people, etc., a lot of violence would be averted. A trust could be bred to where community issues would be analyzed and solved, and community progress could be made. The old analogy that two eyes are better than one is especially true when there in only about one police officer for every thousand people. Throughout the history of the eras of policing and even with the significant progress towards solving crime and utilizing public relations, one constant has always remained. The nature of police work is inherently dangerous. Danger comes in many different forms, including unintentional forms such as a natural disaster, traffic accident, fire, wild animal etc. An intentional form of danger is encountered when a combative or non-compliant subject does not want to submit to the authority the police officer represents. Police officers are bound by duty and their obligation to the public to deal with these situations. To aid the police officer in the execution of their jobs, they have received force options. We will specifically explore pepper spray, baton, taser, and firearm. The modern police force options are an eclectic mix of weapons with roots all over the world. Historical locations include London, Japan, the Wild West, and modern American technology. They present several benefits to the police force and the public as a whole. As opposed to the old days when deadly force or blunt force trauma was often the only option available, modern police options include taser and pepper spray. These intermediate force options cause severe pain, but are usually temporary, not causing permanent injury. This protects the police and the public, and reduces injuries by not having to go hands-on initially when making an arrest. In general all police force options are categorized as lethal or less-lethal. While it is not common for such force options as pepper spray or taser to cause death, it has happened in an isolated number of incidents. Pepper (OC) spray is the most basic level of force option. The substance irritates the eyes, nose, throat, ears, and mucus membranes of the subject by a burning sensation that also causes temporary blindness. It is used to deal with a subject’s passive resistance when such options as verbal commands and hands-on tactics are not effective. Ideally pepper spray is used in an outdoor environment. Care by the officer should be taken when deploying OC, so that the cloud or stream does not affect them or innocent people in the immediate background. The concept of pepper spray was developed in Japan. 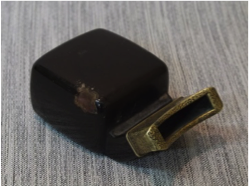 The Japanese police used such devices as the Metsubishi pepper box, see Figure 1. Whole dried peppers would be ground into tiny flakes and stored in the Metsubishi. When deployed, the police would blow into one end of the pepper container like a whistle, causing the pepper flakes to fly out, see Figure 2. This would temporarily irritate the eyes of the subject. In further developing the pepper spray in the 1960’s, Japanese chemists Inagaki and Kosuge discovered and isolated oleoresin capsicum (OC) from the pepper. This substance is the hottest part of the pepper and is responsible for the heat. Pepper spray became more concentrated as a result of their efforts. To better propel this OC substance, the modern transformation was made complete in the late 1960’s with the addition of the aerosol can. The isolated OC substance was combined with liquid and installed into a pressurized aerosol container, see Figure 3. Currently several different forms and concentrations of pepper spray exist, including directed stream, cloud, and foam options. Police were clearing the Strand following the closing of Mardi Gras. They encountered a crowd that was refusing to comply. In addition to passive resistance, the crowd was also actively and aggressively resisting by throwing bottles at the police. This type of resistance could have called for a higher level of force option. However, the police force considered their options and reverted to their department approved training. They considered the background since they were outside. Since the crowd was not listening to commands, the whole background was in violation, and the pepper spray canisters were deployed. The officers were able to make a total of 19 arrests. The officers considered their options, did not act out of emotion or haste, deployed a force option as they had trained and been approved for in the situation, and effectively handled the resistance without excessive force. Police Chief Henry Porretto participated in the important part of public relations following the incident. This appears to be a job well done. The baton is an intermediate less-lethal force option, and other than the firearm, is the most familiar option available to the police. 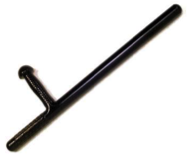 The baton is used to deal with subjects who are actively or aggressively resisting. Ideally the baton is used to strike such areas as the arm or leg of the resisting subject. This is not always possible and there have been numerous cases where baton strikes have inflicted broken bones including strikes to the head, neck, and face of the subjects. In addition to strikes, the baton is also used to block, jab, and manipulate subject’s arms in gaining compliance. Other than the firearm, this has been the most deadly force option in the police officer’s arsenal. 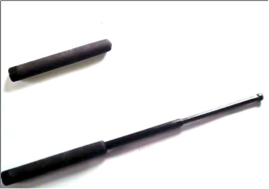 The police baton was utilized under Sir Robert Peel in the early 1800’s and was called a truncheon. 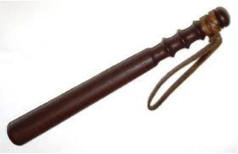 Truncheons were traditionally made of wood with a loop attached to the end as in Figure 4. Other materials including metal, rubber, plastic, and other synthetics have been used as the baton has evolved. In 1958, a former marine developed the staple PR-24 model that became standard in police agencies and is still in use today. The design included a handle towards the base as in Figure 5. The handle caused increased versatility when blocking and gaining control holds. When the handle was grasped and used in a swinging motion, increased momentum and potential damage to subjects was achieved. The most modern form of baton is the ASP, which stands for the company, Armament Systems and Procedures, Inc., which developed it. See Figure 6. 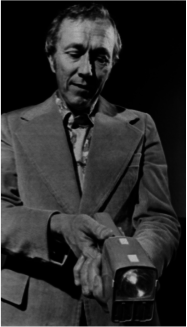 This unique expandable design was invented by Dr. Kevin Parsons in 1976. The design was discreet and was liked for its portability and convenience. Psychological advantage was achieved when it was drawn from the belt and flicked with a snap through the air to extend it. “Another arrest has been made in connection to the Kokopellis brawl on Jan. 25, after authorities say a city man tried to steal an officer’s baton in the midst of the incident. On Feb. 17, Kerif Hassan Burns, 30 of Delaware Avenue, Troy, was arrested as his home after an investigation determined attempted to forcibly remove Officer Brandon Cipperly’s baton as he entered the club last month in response to a reported assault, according to a press release. Police were responding to a reported assault at a club on January 25. The assault involved several subjects which has led to at least 8 arrests. It was unknown if the subjects had weapons. Due to the severity of the incident, and since there were multiple subjects actively and possibly aggressively resisting in an indoor environment that could include innocent people, Officer Cipperly entered the club with his baton drawn. Officer Cipperly encountered Mr. Burns who, according to camera footage, was actively and aggressively resisting. Officer Cipperly was seen waving his baton and hitting Mr. Burns. Mr. Burns attempted to take the baton away from the police officer and was later arrested. Several complaints of excessive force were filed as a result of the incident in relation to the other arrests made. The city has a negative history in regards to excessive force, and has lost lawsuits in the past. One of the problems police face when responding to an incident, is that they are always bringing their weapons into the situation. They must be protected at all cost. In relation to this particular incident, and from the factors considered, it sounds like the officer was justified in his actions. Chief John Tedesco, in considering the community relations from this incident and previous history of complaints, has agreed to an outside investigation to avoid the perception of a biased internal investigation. 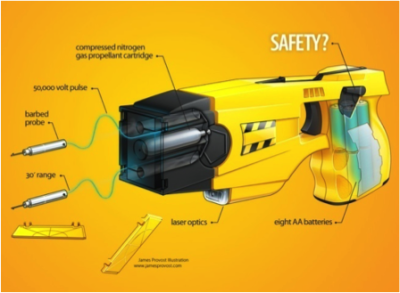 The Taser (standing for Thomas A. Swift’s Electric Rifle which was borrowed from a fiction book) is an intermediate less-lethal force option. The Taser is used to deal with subjects who are actively or aggressively resisting and is arguably the best weapon the police officer employs. This marvel of modern technology was first developed by Jack Cover, see Figure 7, in 1969. This weapon offered several advantages over more traditional weapons. While it is not extremely accurate due to the use of multiple probes, it is a very clean weapon. It can be used in an indoor as well as outdoor environment without having to worry about background like with pepper spray. The weapon delivers a 50,000 volt jolt upon successful penetration of two probes into the subject’s skin. The probes, which are attached by wires back to the weapon, effectively incapacitate subjects without having to hit them multiple times with a baton. In lethal scenarios such as a suicide by cop situation, one officer can have a taser drawn while other officers have guns drawn in an effort to take the subject alive. The modern X-26 version of the Taser, see Figure 8, is much smaller than the original invention and employs such options as tiny pieces of paper with microscopic identification numbers which scatter upon deployment, a video camera, weapon light, and aiming red dot laser. The X-2 is a further enhanced model that includes dual red dot lasers for easier aiming, and multiple shots in the case the first shot misses or multiple subjects are encountered. According to www.tazer.com, this weapon has been estimated to have saved over 122,000 lives. The Taser combines old school force with modern day community policing. The Taser is used to deal with subjects who are actively or aggressively resisting. According to the information presented in the article, the subject refused to show ID in the school library. This was a policy that was clearly posted. This resistance constitutes trespassing and the subject was asked to leave. Police were called after the subject refused to leave the premises. Police responded and the subject continued to refuse commands. This behavior would constitute passive resistance, since he was not actively or aggressively resisting the police. As the situation continued to heat up, the police went for a taser, tased the subject multiple times, and arrested the subject. This incident caused a huge uproar, not just from the student base, but from the subject’s country of origin regarding police brutality. The officer involved in the tasing had received multiple previous complaints regarding police brutality. According to the text book, if a subject is passively resisting and not listening to verbal commands, a control hold would be a preferred option in confronting the subject. After an outside investigation was conducted, it was found that a number of policies had been violated, and the school policy regarding the use of the taser was changed. The firearm is a deadly force option used when the officer or another person is confronted with deadly force resistance. Deadly force from a subject is not just limited to them having a gun. It can include anything that can be used as a weapon including a knife, bat, brick, etc. This scenario is usually the most traumatic situation an officer will face in their line of work and is often a scenario question asked when police are first going through the interview process. If potential police cannot answer yes to using deadly force, or if they hesitate when asked the question, they will not be allowed to continue in the process. While this may seem harsh to some, the reality is that there are members of the public who have no hesitation when shooting someone else or the police themselves. After a shooting, the police officer is automatically placed on administrative leave while the incident is investigated. 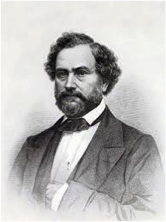 Samuel Colt, see Figure 10, invented his revolutionary revolver, see Figure 9, in the 1850’s. His invention which changed history was the first real multiple shot firearm and incorporated a revolving barrel holding up to 6 shots. Colt has sold hundreds of thousands of many different models and calibers, and was standard issue for the military as well as the police. 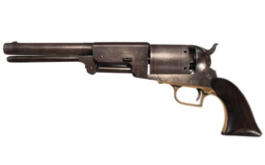 Even though this weapon was invented in the mid-1850’s, it took a while for police to standardize their firearms. Standardization was first achieved by Theodore Roosevelt in 1896 in New York City and was beneficial because in using the same style gun, ammunition was also standard. Before this police officers used their own weapons of choice. 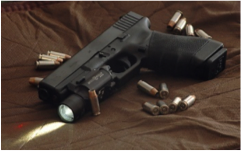 Modern day firearms such as Glock, see Figure 11, invented in 1979 – 1982, and the Springfield semiautomatic pistol invented in the 1990’s, further revolutionized the firearm. Increased ammunition capacity in easy to load magazines, coupled with semiautomatic fire made the firearm much easier to use. These tactical pistols were easier to fire and more accurate. Grips could be added for increased comfort and performance. Flashlights could be added on to the end to free up a hand so the officer could communicate and do other tasks while holding their firearm. The firearm remains the most visible force option a police officer has in their arsenal. This situation is unique because it was witnessed by one of my employees. I work for a security company out of Westlake where I have been the Field Supervisor in charge of all the security officers for the last three years. I had just finished training one of my Watch Commanders. His first solo patrols were the weekend of this incident. Just after 9:00pm on this date, my Watch Commander was approaching the mentioned intersection. He heard sirens and pulled off to the side of the road only a couple hundred feet away from the incident. He observed a car pulled over at a strange angle against a curb of the intersection. A police car arrived to and stopped in the intersection. The police officer got out and pointed his firearm at the stopped vehicle. The vehicle started moving, taking a left turn towards the officer. The officer, fearing for his safety, opened fire and hit the subject multiple times. A second police car arrived and rammed the subject vehicle from behind, knocking it over another curb of the intersection. The subject was taken out of the vehicle and was transported to the hospital. He is now facing several charges in an ongoing case. In this situation officers were responding to a call of a hit and run. A responding deputy found a vehicle matching the description of the offending vehicle. Upon attempting to pull over the vehicle, the vehicle fled. A second responding deputy’s vehicle was struck by the offending vehicle as it attempted to flee. After this is when it ended up stopped in the intersection. According to the known factors of a deputy being hit by the offending vehicle, the vehicle driving towards a deputy with a drawn weapon, and the deputy being confronted by possible deadly force, this sounds like a good shooting. The officer involved also had the presence of mind in an intense situation to consider his background. As the vehicle was turning towards the officer, the officer was pivoting as he was shooting. He stopped shooting before he would have pivoted too far and possibly shot my Watch Commander. This officer appears to be very well trained while still keeping in mind the protection of the area. Attached to this report is a piece of the front driver side light marker from the unit that rammed the subject vehicle. Deadly / lethal force in the form of a firearm has always been the staple throughout the Patronage, Reform, and Community Eras in American law enforcement. 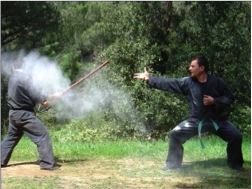 The baton is a simple weapon that has also been around throughout history. The new additions in pepper spray and taser towards the end of the Reform Era and the beginning of the Community Era have added intermediate level options that cater more towards a rights conscious, community related society. They have saved thousands of lives and protected police and the public from numerous injuries. The Police Officer armed with this versatile, easily portable arsenal combined from historically different times and countries, the correct training, and the ability to remain calm under pressure, is a modern day warrior in combating almost any situation.